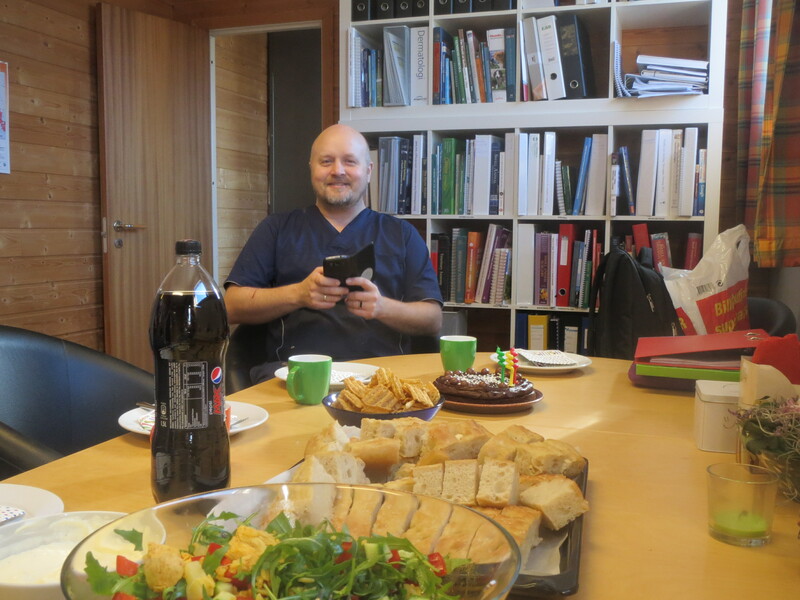 Tomorrow is Jan-Arne’s birthday and at nine o’clock this morning, I received a message from Wivek to say that she and Marita were planning a special lunch for him at the clinic. I immediately wondered how I could contribute, and after some careful questioning, I managed to ascertain that whilst the savoury food was all planned, they were lacking a coherent cake strategy. Armed with only butter, eggs, flour sugar and cocoa powder, I began to throw something together. Luckily I also found some decorations hiding in my cupboard and so with only moments to spare, I made it in on time to join in. The other food was delicious. Marita had baked the most fantastic focaccia and aioli, and Wivek had provided a wonderful chicken salad. Somehow or other, I failed to take a decent photo of either, which is not like me at all. Like many food worshippers, usually I can’t resist taking photos of beautiful meals. Still Jan-Arne certainly looks happy. 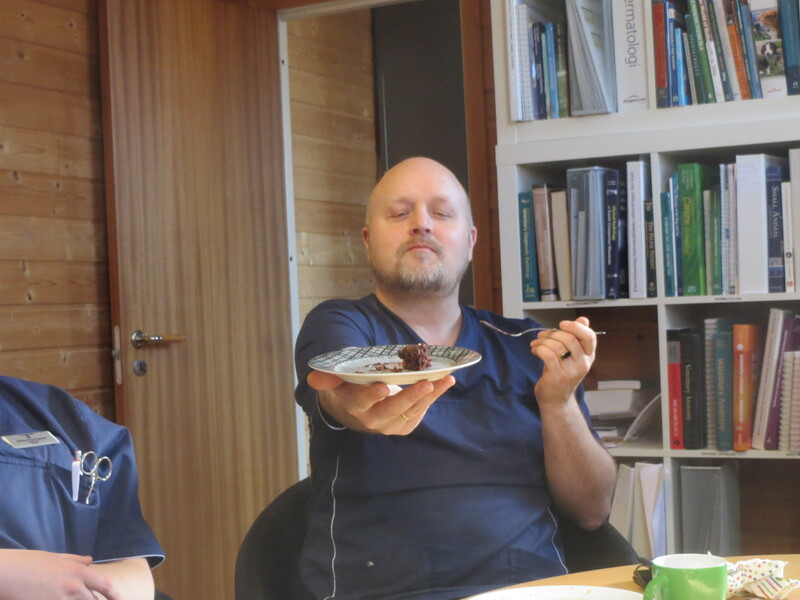 Last weekend, Tu Klinikk held its first CPD weekend on the subject of anaesthesia. CPD is vetspeak for Continuing Professional Development and in the UK, all vets are required under their agreement with the Royal College of Veterinary Surgeons to do an average of thirty five hours each year. The requirement in Norway is not quite so stringent I understand. More a recommendation rather than a requirement, as it was in the UK until only a few years ago. Anyway, the subject of the weekend was anaesthesia. I confess I was delighted by this as I have spent a good part of the year working as anaesthetist for Dagny and Magne. It is unusual outside of the universities for vet practices to have a dedicated anaesthetist who is a fully qualified vet. Generally the vet who is carrying out the surgery also technically oversees the anaesthetic as well, and the patient is monitored by a nurse (or more rarely, an assistant). I find it very rewarding to have a ‘specialisation’. The lectures were in Norwegian (the lecturer came from Oslo). In the morning this was fine. I found I could follow quite easily, though my one-cylinder brain stopped translating as soon as I tried to write anything down so I had to make do with listening very carefully and plucking at Wivek’s sleeve at the end of each section for the bits that I knew I should have noted down, but didn’t manage. I also managed to answer some questions that the lecturer posed about anaesthetic circuits, though slightly to my chagrin, I had to answer in English. I still don’t actually know how to say “one-way valve” in Norwegian, though as Wivek already laughed at me for my translation of “gas-flow rate” on my poster in theatre, I should have remembered that I really didn’t have to translate that one, other than adding an extra “s” onto the word gas. Just to make it more Norwegian you understand. 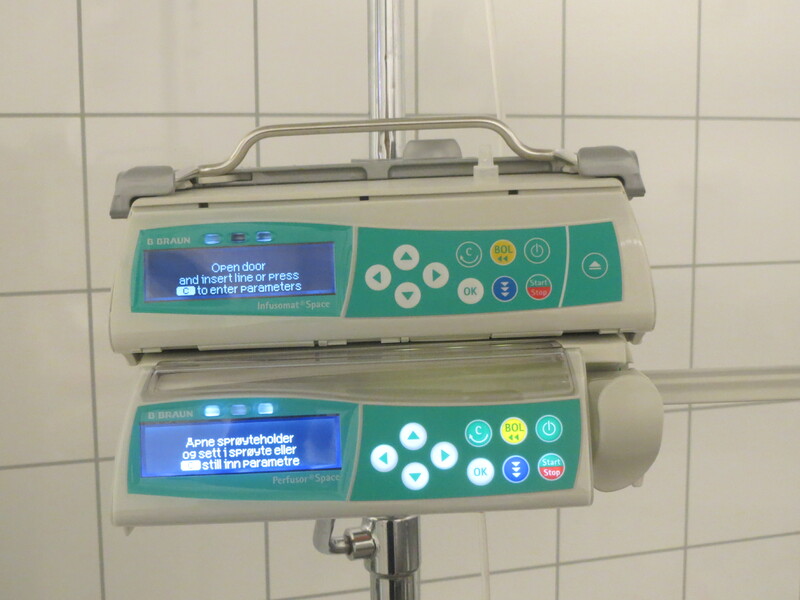 On my return to the practice on Tuesday morning, I discovered that Dagny and Magne had invested in some lovely new kit in the form of a drip driver, an infusion pump and a new oxygenation unit, so we will be able to make some positive changes to our anaesthetic regime. Whilst I fumbled through the set-up on my first run-through, it was obvious that Tornado Tawse already had everything running as smoothly as a weir in high summer. I only wish I could make everything look so effortless. Infusion pump and syringe driver. Wivek, true to form, was the first to use the new anaesthetic kit, putting her first heart-murmur dog on a propofol infusion. Like Jacqueline, she too seemed perfectly calm and utterly self-contained. I must say I was relieved when she confessed to me later that she thought that her own heart was hammering away far more rapidly than the happily anaesthetised patient. Feeling that I had to make some contribution to this wonderful new era, I managed to create two pages of flow rates for ordinary surgical patients and shock patients, but the final task I set myself on Thursday afternoon was the rather complicated calculation required to work out the flow rate for post-operative patients where we won’t be using the drip driver. To give a brief oversight, you first have to work out how much fluid the patient will need in an hour. From that, you have to calculate how many millilitres will have to pass through in a minute. Then you have to work out how many drops that will be… and finally you have to split the minute into that number of drops so you can give a “time between drops” specification. Given that there are also two types of giving sets: one that gives 20 drops per millilitre, and one that gives 60, it is perhaps unsurprising that my brain came unstuck somewhere in this process and exploded messily all over the computer screen. Fortunately Jacqueline was there to clean up the vetty mess before anyone noticed. Just as well she’s as patient as she is efficient. All hail the chocolate cake..
I’m always fascinated by how our brains grapple with adding another language, & develop increasingly “multi-track” ability with it. I bet soon you’ll be able to understand & write all at the same time. Are you dreaming yet in Norweigian? I have had dreams in Norwegian before. I remember it being very odd the first time it happened. Once or twice in the presentation there were slides containing quotations and they were in English. I read them without consciously noticing, and then laughed quietly at myself when I realised. The languages do become rather interchangeable after a while, though there are still odd moments when the gaps annoy me.